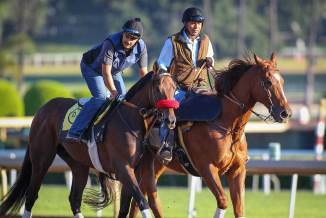 At his home base of Santa Anita last Friday morning, Kentucky Derby winner Nyquist had his first workout since returning last Sunday from Baltimore where the son of Uncle Mo trained by Doug O’Neill for Paul and Zillah Reddam suffered his lone defeat after eight straight victories, finishing third in the Preakness Stakes. At the convenient time of 7:11 AM in ideal conditions under exercise rider Jonny Garcia, Nyquist worked four furlongs in 48.60, breezing, according to Santa Anita clockers, who caught him in 24.60 for the first quarter, with a five furlong gallop out of 1:02 flat. “It was kind of a medium gallop out, kind of a two-minute lick gallop out,” O’Neill said. “I got him in 48 and two (fifths). I’m very happy right now, but a lot will depend on how he cools out and what Jonny says. He looked good to me. Nyquist, champion two-year-old male of 2015, missed the Belmont Stakes due to an elevated white blood cell count that surfaced after the Preakness. Nyquist was foaled on March 10, 2013. He won the 2016 Kentucky Derby and the 2015 Breeders’ Cup Juvenile, becoming only the second horse to complete the Juvenile-Derby double. He became the eighth undefeated winner of the Kentucky Derby, and the first since Big Brown in 2008. He received the 2015 Eclipse Award for Champion Two-Year-Old. Nyquist is a bay colt with no discernable white markings. He is currently owned and trained by the same team who won the 2012 Kentucky Derby with I’ll Have Another, J. Paul Reddam, and Doug O’Neill. As Reddam is a fan of ice hockey, he named the colt after Gustav Nyquist, who plays for the Detrout Red Wings. On the morning of the Kentucky Derby, the NHL brought the Stanley Cup to Churchill Downs, where Nyquist (the horse) posed with it.